The Amazing Hupfeld Phonoliszt Violina plays violins along with piano accompaniment. 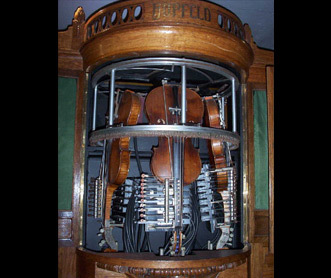 Each violin has one playing string (D, A and E respectively) and is pushed against a circular horsehair bow giving an accurate reproduction of a violin playing. The vibrato, bow speed and violin pressure are varied by coding in the roll to give expression to the violins. The tracker bar can be turned upside down to enable the instrument to play "Phonoliszt" expression piano only rolls. Once made in their thousands there are few surviving Violinas. 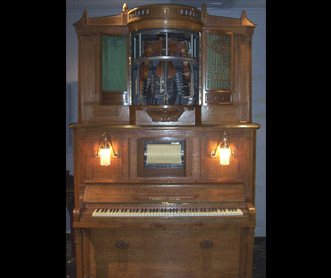 This popular exhibit is the only known oak case example.